—to find everything you’re looking for. Showcase: Browse our collection of featured content about the Ocean, Moon, 3D buildings and more to see all the ways you can explore the world around you. Video tutorials: Whether you’re new to Google Earth or an expert user, watch our new video tutorials to learn how to create placemarks, record a tour, add a 3D building, import GPS data and more. More products: See all the different ways you can experience Google Earth. Did you know you can access the 3D globe from your phone or on Google Maps? Community: Get connected with other Google Earth fans in our forums and stay up-to-date through our newsletter, blog and Twitter feeds. Industries: Everyone uses Google Earth for a different reason, so we created unique pages for educators, media, developers, businesses, non-profits and data providers. Now it’s your turn to explore the website on your own. Right now, it’s only available in English but don’t worry, we’ll be adding more languages soon. 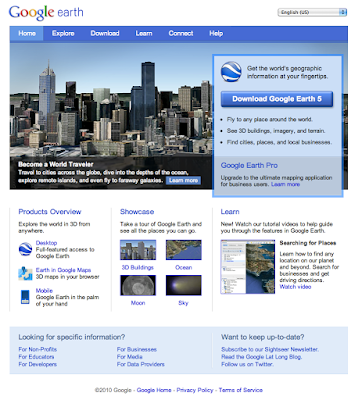 Check out what’s new with Google Earth at earth.google.com. When you think of Google Earth, you might think about flying to the top of Mt. Everest, surveying the ancient Acropolis, or simply finding the house where you grew up. For the past five years, people all over the world have been discovering new places to explore through our community, blogs, news articles and Gallery. Now you can go to one place—our brand new Google Earth website—to find everything you’re looking for.